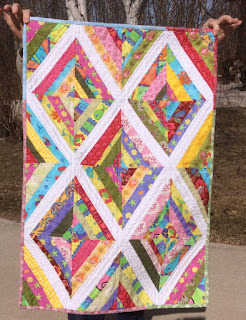 Today we start a journey through some (no doubt) fabulous string quilt projects. My personal favourite string quilt shape is the diamond string. 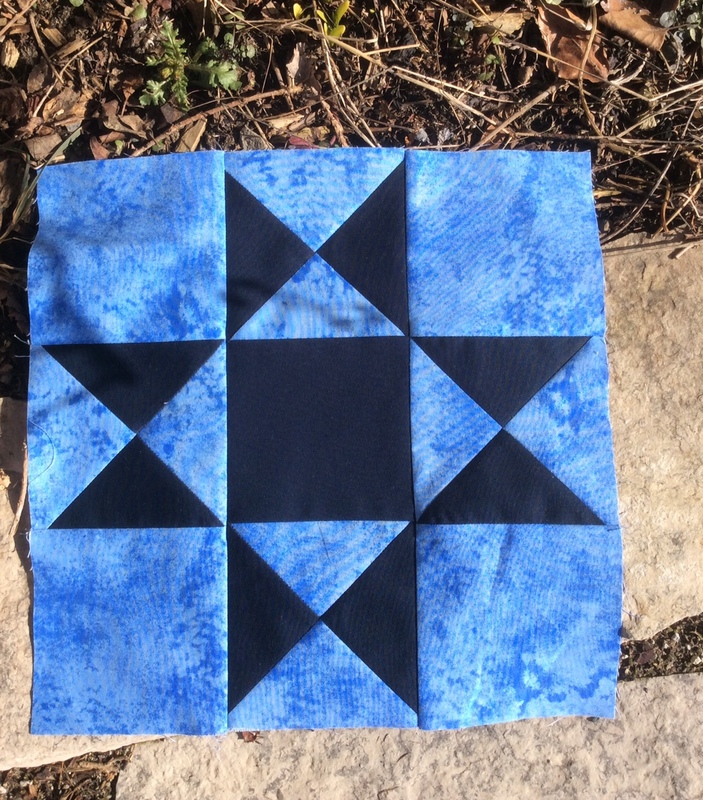 It is almost as simple as the regular or standard string quilt but has one little wrinkle. 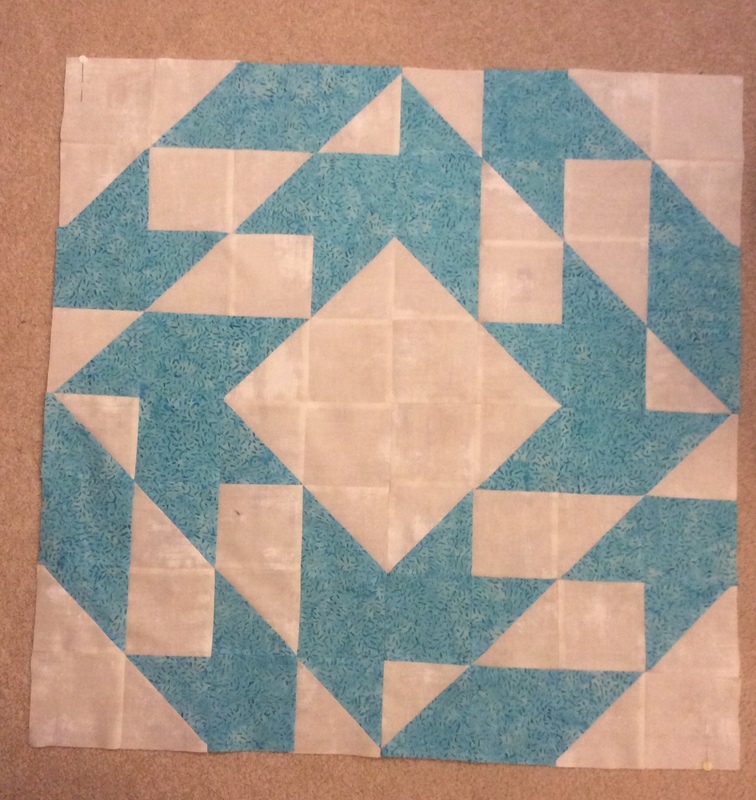 This is my wee diamond strings quilt. It is all quilted, labelled, washed and ready for donation. At approximately 30" x 40" it is relatively small but would be great for tucking around baby for a walk in the stroller. To get started on this you need a foundation. I prefer some really thin cotton. Old sheets work well for this or some prefer muslin. I have not yet been converted to telephone book pages although I have tried them. 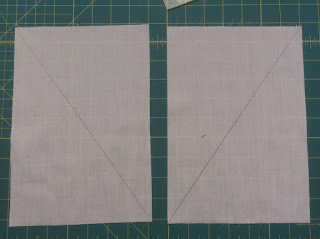 For the diamond string your base shape is a rectangle. Mine for this project were 7" x 10". I have made doll sized ones using 5" x 7" (and downsized the centre string). Any size will do as long as it is definitely a rectangle to start with. The trick: Half of the starter strings must reach up to the right and half of them must reach up to the left. 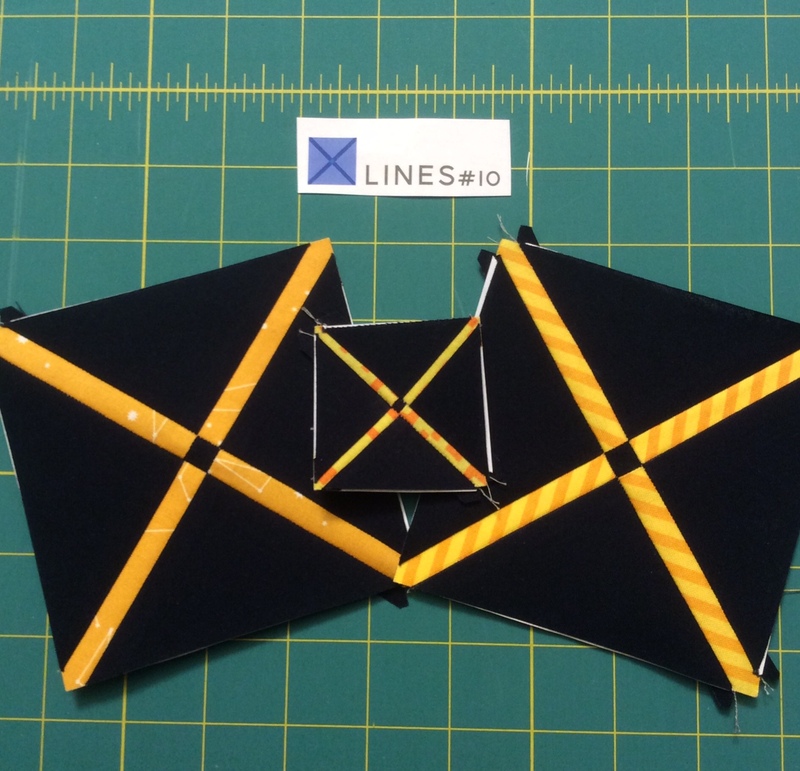 On these two backings you can see the drawn centre line for the string placement. One goes towards the top right and one goes towards the top left. I just use the lines on my cutting mat to line things up. If I had used the rectangles in the diagram above with my white centre strings the pencil line would show through and you don't want that! My centre strings are 2" x 14" for this size. That gives overlap at each end. You can make your centre string a different width but it since it highlights the pattern so make it something a good size. Also note that the centre string should contrast with the strings you are going to use. 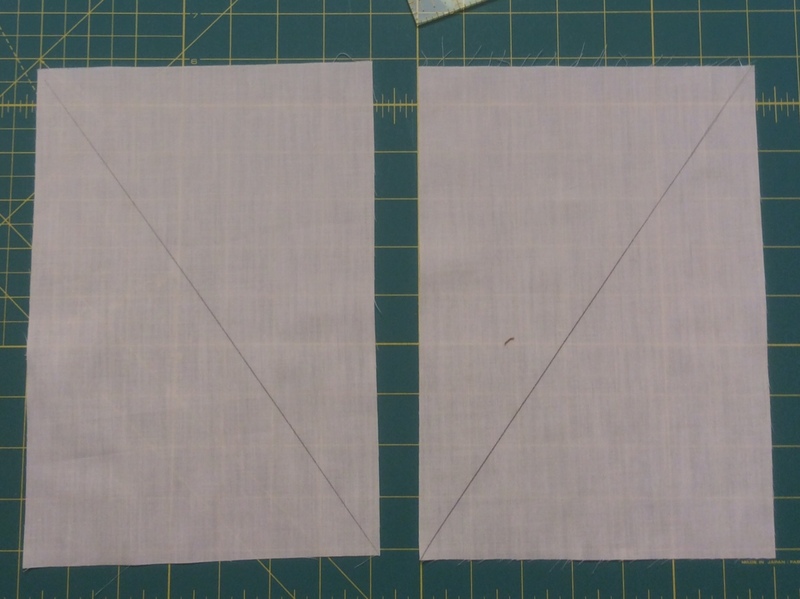 Then you start stitching strings in place right sides together, using a 1/4" seam. I press after each added string. That stops me from sitting for hours in the same position and it makes the my work neater. Some people finger press. When you have covered all of your foundation your block is ready to trim. The one on the left is what it looks like from the right side the one on the right is what it looks like from the wrong side. Once trimmed this is what the blocks look like. I try to make certain my centre string is centred when I am doing the trimming for each block. 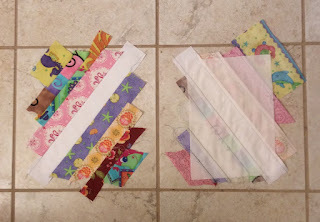 Next step artfully arrange your blocks and stitch them together. 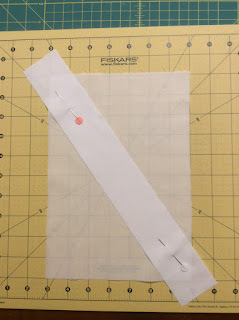 At this stage I will often use a 3/8" or even a 1/2" seam and press it open because there is a lot of bulk if you press to one side. Please stop by the other bloggers who are on this fun Blog Hop to see what they have to offer. We all have strings lets get using them. I had a few too many appointments yesterday and didn't get a photo up for Lines #9. A final couple of tips to add to the mix. Make certain you have the best possible light to work in. My hubby bought me a natural light desk lamp when I retired. I was a wee bit disappointed as I thought he was getting an Ott lamp but this natural light has turned out to be a blessing. Colours look real, there is no glare, I in fact have grown fairly rapidly to love it. It can be taken to retreats but I now have a smaller Ott lamp for that purpose. Daylight is not really enough. And Lines #10. This is that last of the Lines section of the pattern. Next week we move onto Shapes. As you move through each "chapter" the blocks become a little more challenging. 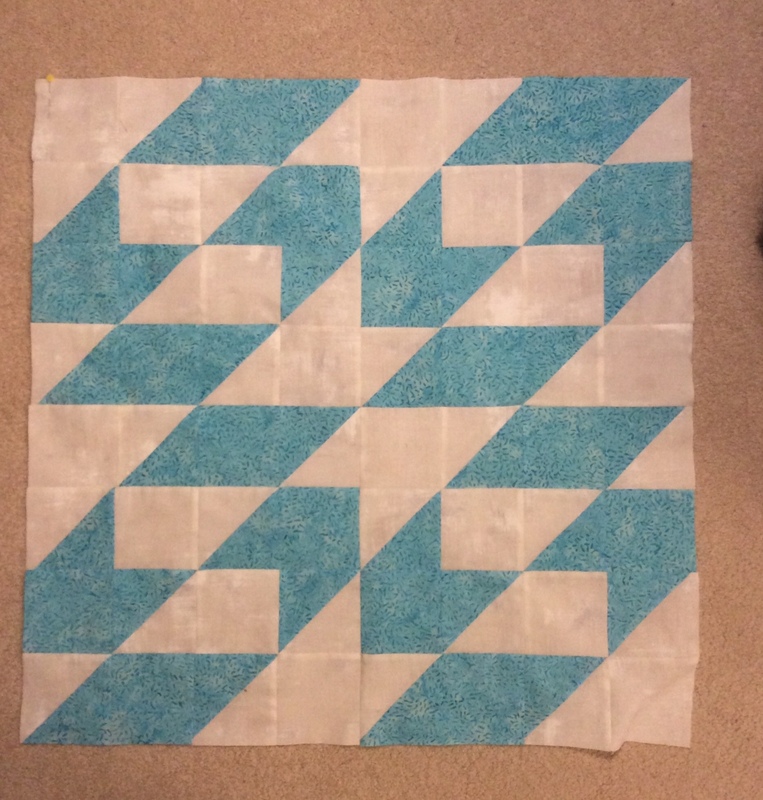 These blocks are all foundation paper pieced. 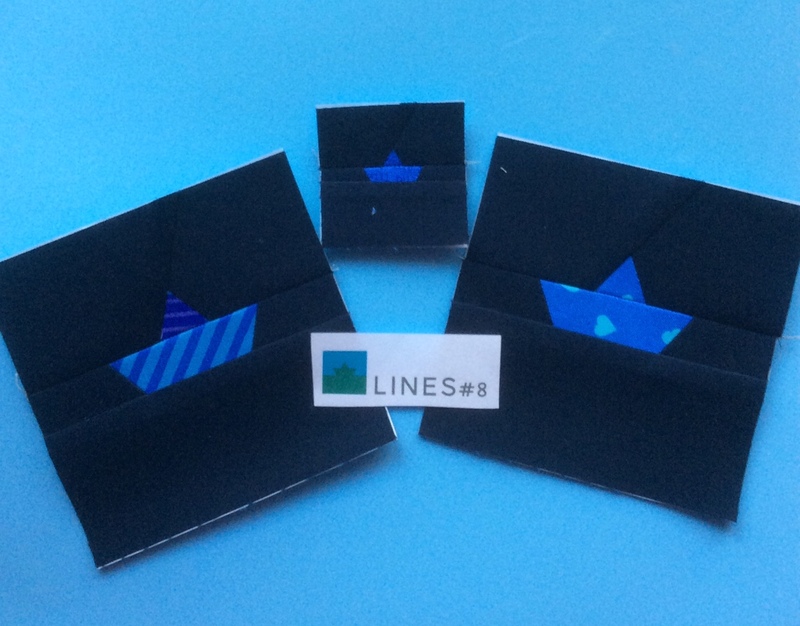 There is special paper that can be purchased for paper piecing. But it is fairly expensive and not all printers love to feed it through. So I use regular printer paper. I have used both and while the special paper is easier to remove when it is time for paper removal the standard printer paper causes no difficulties. This is the end of my week supporting Darla at Clinton Modern Creative (here). She has been an official shop sponsor of the Sew Along this week. Remember that she is offering a 15% discount on instock merchandise for the rest of the week. Just enter TRINKET15 when you checkout. Here they are. The blocks are starting to get a little bit more complex but still very manageable. This one has two parts to it. Remember my smaller one is downsized to 2 1/8" from the standard 4 1/2" unfinished. I leave the paper on until I am joining the block to something else. Why you might ask does one person need two irons? I NEVER put water in my dry iron. 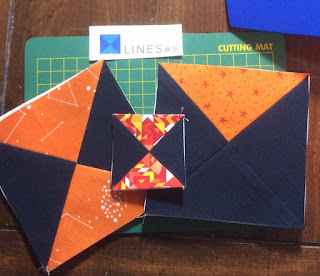 I use a dry iron for all my paper piecing. 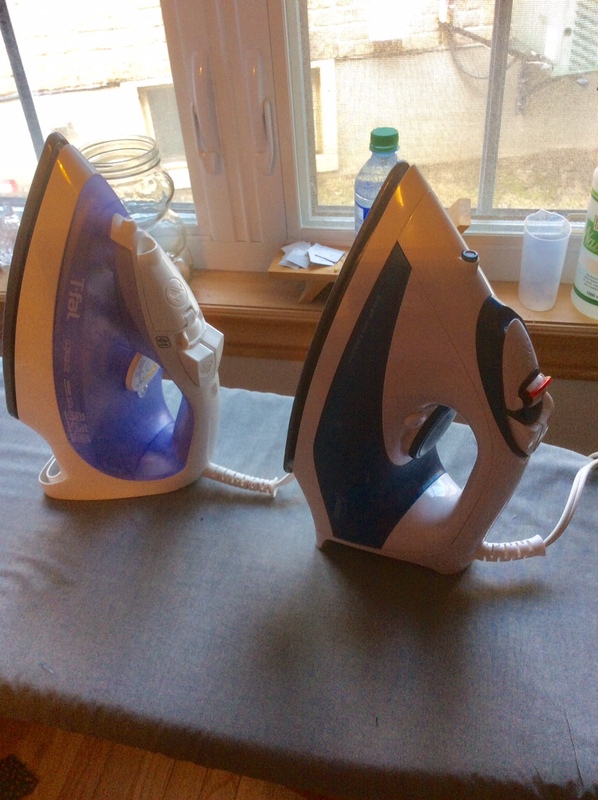 I have a separate iron for steam and regular stitching. 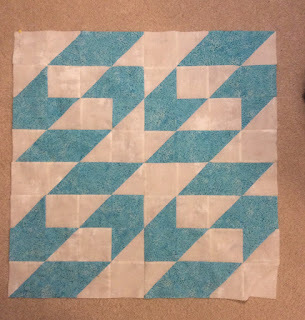 Pressing is one of those areas where quilters primarily agree to disagree. Most are in one camp or another. I might consider myself a fence straddler as I like steam for some purposes and a dry iron for others. Just a friendly reminder that Darla at Clinton Modern Creative is a Trinkets Sew Along sponsor this week. All week she is offering 15% off at checkout if you use the code TRINKET15. She has some fantastic fabrics in her shop. For me these are fabrics that I cannot purchase locally. You may possibly be able to find them if you live in the city but they are found in semi rural Ontario. 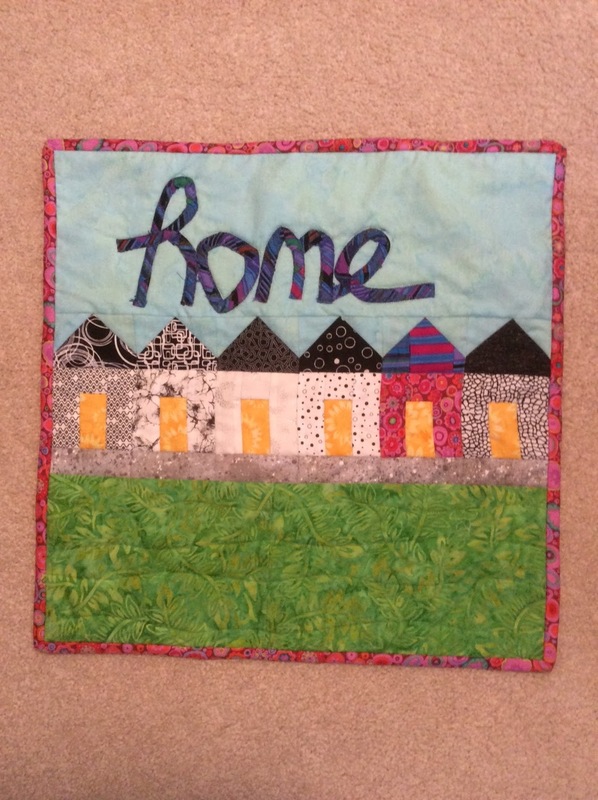 The Trinket Sew Along is progressing well with many participants from around the globe. That is one thing I certainly enjoy about these type of events. Seeing for instance an Aussie's take on something I am doing here in southern Ontario. I have had little difficulty keeping up. As I may have mentioned it is taking me longer to pick my fabric than to stitch the blocks. The larger blocks are the actual size for the sew along and the smaller one I reduced to 40% on my printer. I had to play with that a bit so don't take that as a given for your printer. The smaller block is currently 2 1/8" unfinished. You may wonder what in the world. 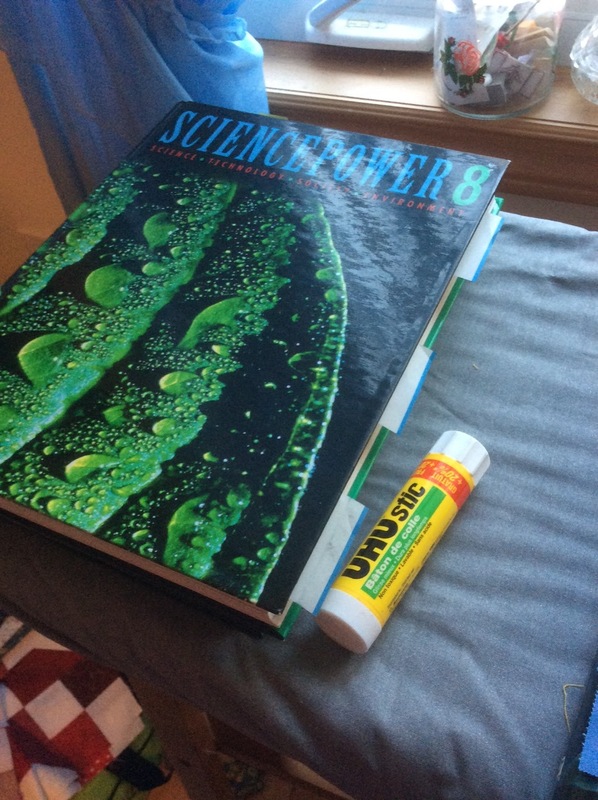 It is a heavy book and a glue stick. As I finish a block component I flatten it under a heavy book. I happen to have a couple of copies of SciencePower 8 as I was the author of the Teacher's Manual for one section of this grade 8 text book. When I am ready to assemble a multisection project the components as definitely smooth and flat. The glue stick I use sparingly when I have a long section at the end of a component. These Trinket blocks do not have any long sections but sometimes on a larger piece you get an untethered piece and the glue stick keeps the paper and the fabric together. 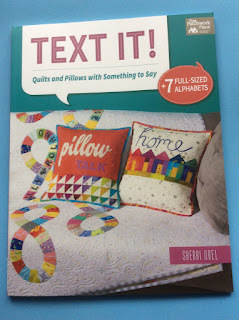 Please remember that Darla of Clinton Modern Creative (here) is a shop sponsor for this sew along this week. She is offering a 15% discount at the check out for any in stock merchandise this week just use the code TRINKET15. This is a small sample of what I am talking about. 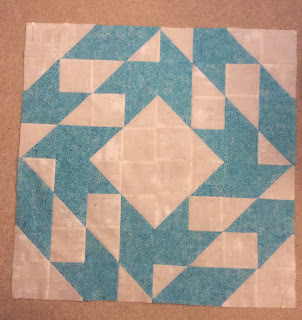 Alison glass has created a pattern with 40 Foundation Paper Pieced blocks. 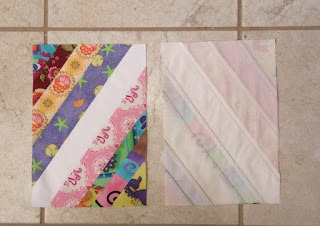 Last week was the first week for this sew along and each day you make one block and post it. She has a Facebook group as a support network. But better than that she has sponsors. This week one of the sponsors is our own Darla from Clinton Modern Creative (here) a fantastic (if you like fabric) Canadian online fabric store. She is located in Saskatchewan but I feel as though I know her personally her service is next to none. A few Canadian bloggers are supporting Darla with some blog posts especially this week as she is one of the big sponsors for week two. To get a discount of 15% at check out this week use the code TRINKET15 at check out. 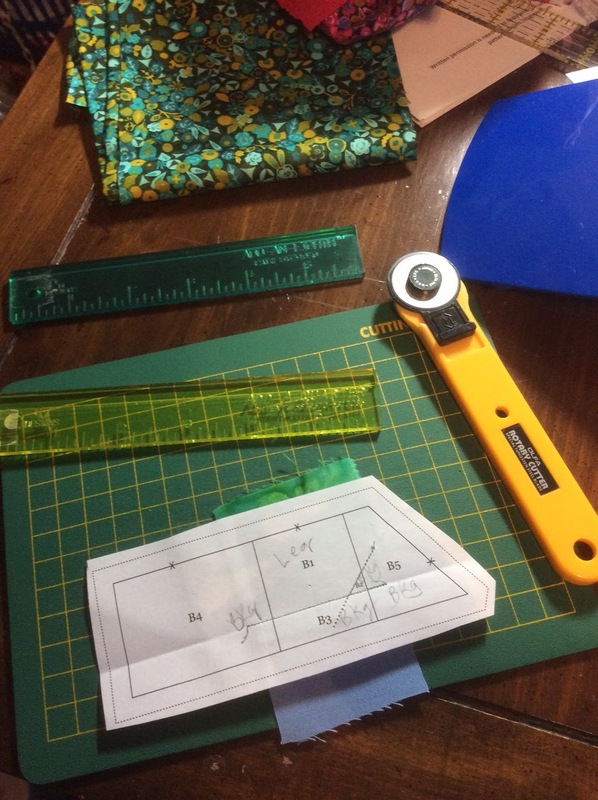 I would like to add a bit about the actual sewing part of the sew along. These are my actual "tools" for the task. You require a paper pattern. On this piece I have started you can see the fabric is "underneath" the paper. that's right you stitch on the lines you can see but build the design up in fabric on the underside that while you are working you can't see. 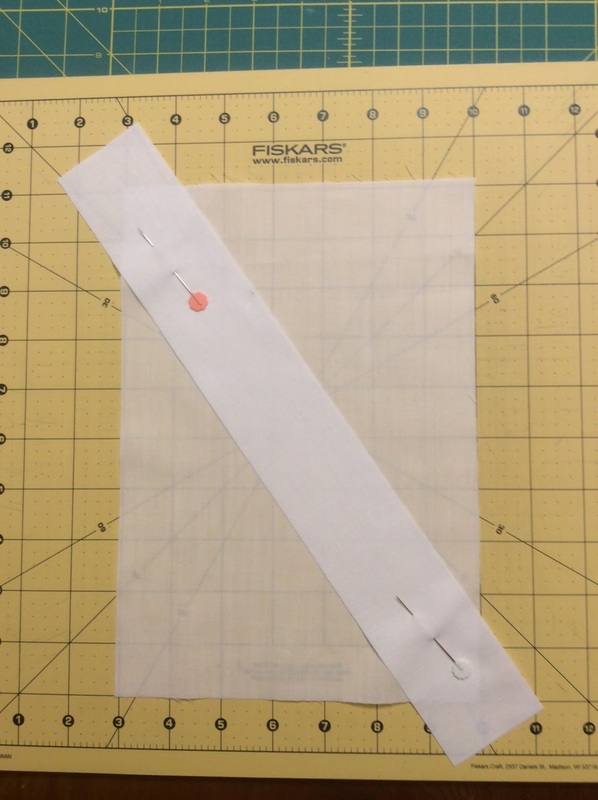 I use my smaller rotary cutter for trimming and I have both the add a quarter and the add an eighth rulers. 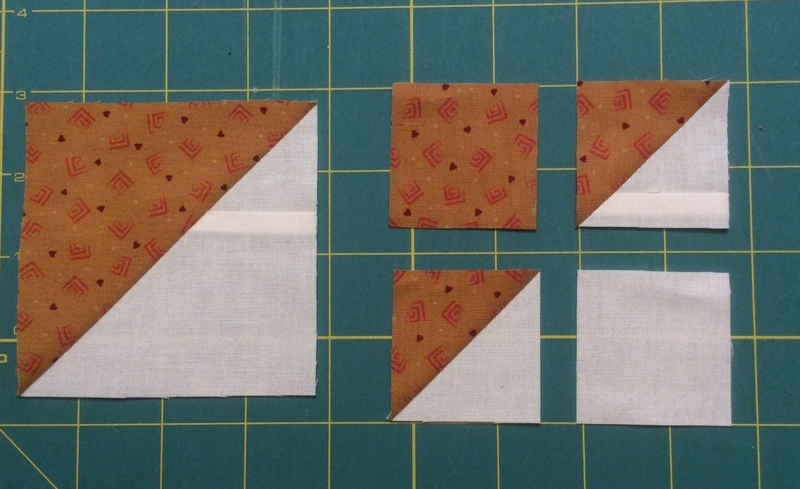 I am using the add a quarter for the standard sized blocks in the sew along and the add an eighth for the miniaturized block. I hope you have found this fun blog hop and are enjoying the projects the other bloggers have shown you from this delightful book. 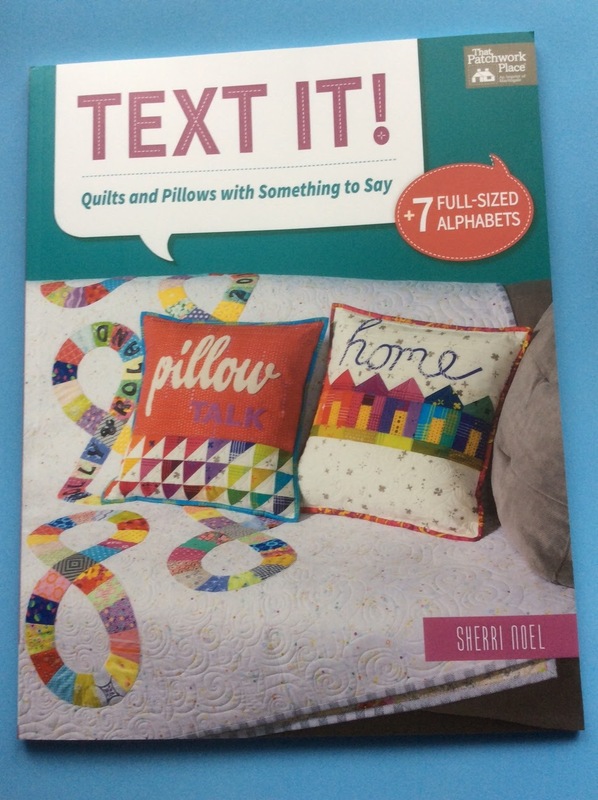 Sheri Noel who blogs and works as Rebecca Mae Designs has written a fun book with each project having some form of text on it. (All appropriate/necessary patterns included). The book includes a good variety of techniques but is leaning towards applique and English Paper Piecing as opposed to regular piecing. That being said my project is regular piecing with a tiny bit of applique. Each blogger on this hop is offering a free copy of the book as part of a give away. And as one has come to expect it was only open for US commenters. Sheri however was kind enough to send me a copy of the book for a Canadian only give away. Apparently Canadian rules say you must answer a skill testing question to be eligible for the prize. So if you are Canadian with a Canadian mailing address and would like to enter the draw this is the skill testing question. ( 24/3 + 2) Include the answer in your comment please. 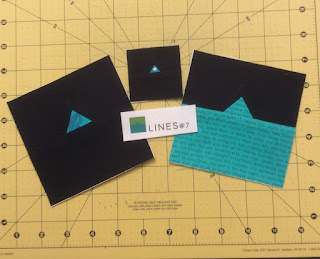 There is a second give away open to anyone and it is for two spools of Aurifil thread. The draw for both of these prizes will take place on Saturday morning March 16. Now that the technicalities are over here is my project. In the book this is a pillow but I made mine into a small quilt. All of my "homes" are black and white except for the one that is really home and it is filled with colour. When my Mom and later my brother were in care facilities I made them small wall hangings that meant something to them to hang on their door or on the wall beside their door. It helped them find their way on a long corridor of doors that all looked the same. My brother preferred the backing I used on his as it had hockey players and Canadian flags but it marked his room. I am not a skilled applique person and found I had a little difficulty making my word home look as neat as I thought it should be so I would call that operator error not designer error. The giveaway is now closed I am working on notifying the winners, thank you all for playing along. Here is a set of links to the other bloggers on this hop. enjoy! 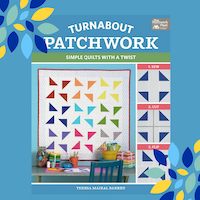 By now you may well have seen a few of the fantastic quilts that have been made following the instructions in Teresa's new book Turnabout Patchwork. A few years ago I tested a pattern for her that used the concept she is describing in the book. I will freely admit I do not have good enough spatial sense to do this on my own. But following her directions makes it easy. I volunteered to do one of the Half Square Triangle projects. 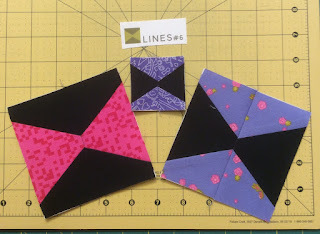 My first mistake was when I made the HST's I was not paying enough attention and instead of using the four at a time strategy for making the HST's I used the two at a time.This left me considerably short of the number I required to duplicate the pattern in the book. But my blocks were much bigger so instead of several blocks I created fewer but larger. This then is a four block Swirl top. It is actually big enough to be a small baby quilt. I had four blocks left so decided to rearrange them a little and got this. So you can perhaps see this is a flexible block and a really flexible strategy. To create the units you need for the block you take your squared up HST and cut it into four equal pieces. Those sub-units are what you play with. Teresa has kindly offered an e-copy of her book as a draw prize for comments left on various blogs. Please feel free to leave a comment but please with some way of contacting you as I have not heard back from my previous draw winner and will have to move on to person 2 this weekend. Draw for the e-book will be next week, February 9th.